Wait, is that a baby eagle? First published by the Duke Nicholas School. It was the last few days of 2016, and I was in the office. Though I was lucky enough to take off a bunch of days around Christmas, I had to make up the hours before my time sheet was inevitably due. The office was fairly quiet, so a coworker sent me the link to a nest cam overlooking a pair of Bald Eagles in Naples, Florida. After the adults had incubated their eggs for over a month, the eggs were about to hatch. With any luck, I could see the babies. Given how much I love birding, you would think that I would have nest cams wallpapering my entire computer screen. Though I’ve caught glimpses of puffin and eagle parents, among others, I can’t say I’ve actually followed the progress of any one nest. 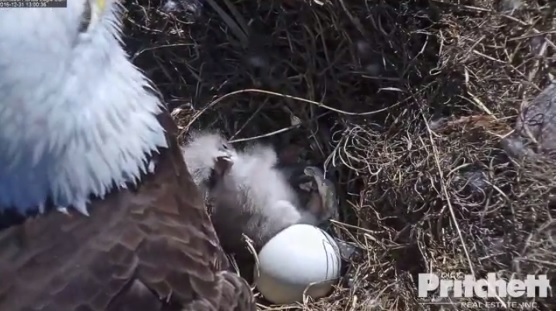 I forget to click back to the video, or the quality is bad, or the weather makes viewing difficult: whatever the reason, soon I merely forget to pay attention to whatever eagle cam I’ve chosen. So it almost went with the South Florida eagles, until one fortuitous moment.Clicking from tab to tab to find an article I wanted to read, I found myself once again staring at the eagle’s nest. Only, instead of the brown back of the adult I saw the tiny, delicate, fuzzy, gray body of a Bald Eagle chick! “Oh!” I gasped out loud, taking in the tiny head, the thin wings, the incredible size and power difference between the chick and what she (or he!) would become. Obviously I fell in love with the baby the moment I saw her, and though she spent most of her time in the subsequent hours keeping warm under Mom’s feathers, I clicked back again and again and again with hopes of another glimpse. Without the nest cam, it is extremely unlikely I could see these up-close-and-personal moments between parent and offspring. Nest cams are now on and streaming all over the country, and include many raptor species as well as puffins, terns, guillemots, and more. Millions of people tune in to watch the adorable moments and learn about the birds that live alongside us; the Southwest Florida Eagle Cam that I watched has amassed more than 60 million views coming from 190 countries since its launch in 2012. From school projects to adult education, the nest cams are a valuable learning resource for scientists and the general public. Unfortunately, the “up-close-and-personal” viewpoint also reminds us of the darker side of nature. In 2013, one pair of eagles brought a cat carcass to their nest, immediately going viral. Not all chicks survive and fledge, which means viewers must watch them die, even consumed by their siblings or parents. I’m not going to lie, though I know this is the way nature works, it’s not something I particularly want to see. In these instances, I would probably just turn off the camera feed, but other viewers have become so aggressive that nest cam operators have been forced to shut them down. In general, cam operators will only intervene if distress has a human cause (like plastic pollution). Others are forced to act against their better judgment. Such is the case for the Woods Hole Oceanographic Institute, which had been following the progress of an Osprey nest. When the Osprey parents neglected their young, certain viewers began calling staff, demanding intervention. When staff refused, the attacks became personal and threatening. Eventually, the calls became too much, and a wildlife biologist removed the chicks. Rather than risk another season of forced intervention, Woods Hole shut off their nest camera. 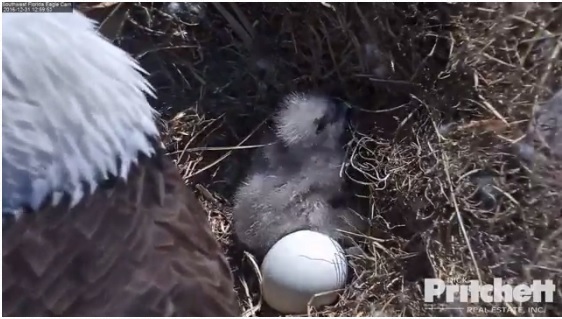 Despite the drama associated with chick death, I believe the nest cams can be a powerful communication tool, inspiring awe and wonder in both children and adults. I’ve seen hundreds of Bald Eagles, but now I carry with me the crystal clear image of one of their newly-hatched chicks, providing an entirely different perspective on eagles as a whole. If you want to check out the Southwest Florida Eagle Cam, click here. Audubon’s nest cams can be found here, while the Cornell Lab of Ornithology has more to choose from here.